If you ride the subway, take the bus or even walk down the sidewalk, you know the phrase “I Love NY” is all around us. Tonight, it was alive and in action in front of the iconic Flatiron building, where a few of the city’s hottest instructors and fitness bloggers gathered for the official #NYCFitWeek selfie. The brainchild of She’s the First, a non-profit dedicated to girls’ education, and Emily Cook Harris, founder of EMpowered personal training and Racked Hottest Trainer in 2013, NYC Fit Week is rallying boutique studios and fitness fans to pay it forward by sweating for the cause. 100% of proceeds from 16 classes at many of NYC’s most popular studios including 305 Fitness, Flywheel, The Fhitting Room and Uplift Studios this week will go toward helping girls around the world become the first in their families to graduate. The fun is already underway, so book now! 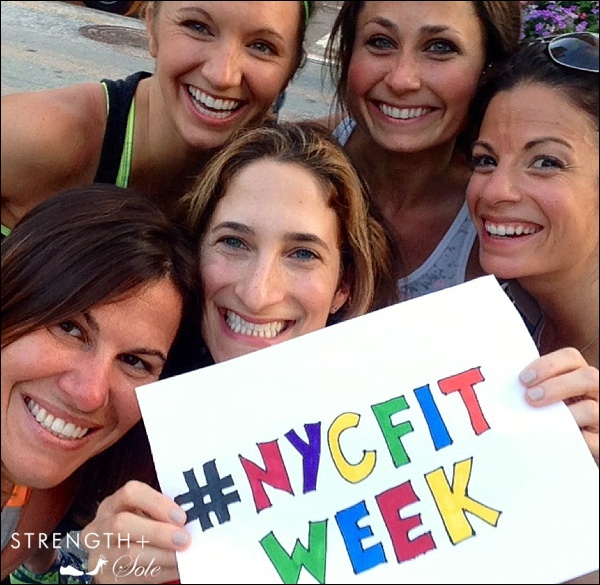 And, show us your sweaty selfie in front of the Flatiron or around town after class by tagging #NYCFitWeek. Featured in photo, clockwise: Emily Cook Harris (EMpowered NYC), Julia Avery (The Fhitting Room & average2athlete), Dyan Tsiumis (SWERVE), me and Jaclyn Sklaver (FitmissNYC). How beautiful ladies! i love this rb! And doesn’t need to be said, but I LOVE NY!!!! Thanks! Of course and NY loves you!